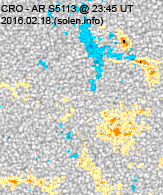 Last major update issued on February 19, 2016 at 04:35 UT. 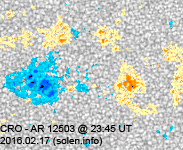 The geomagnetic field was unsettled to minor storm on February 18 under the influence of a high speed stream from CH715. 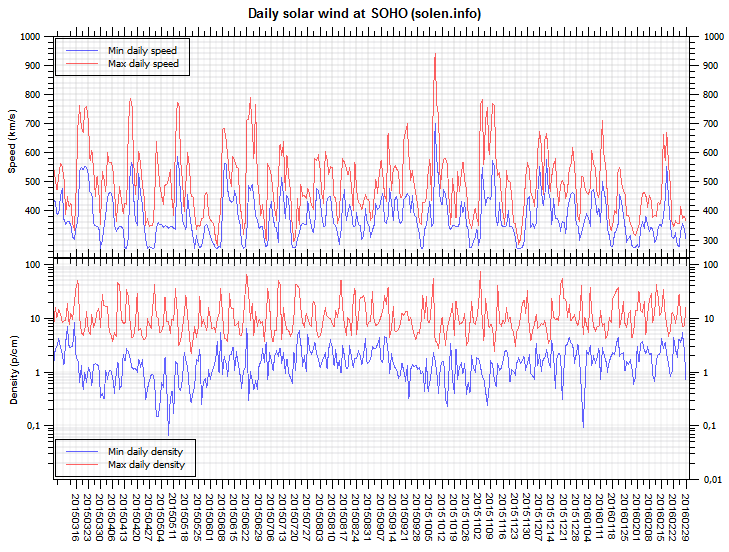 Solar wind speed at SOHO ranged between 548 and 663 km/s. 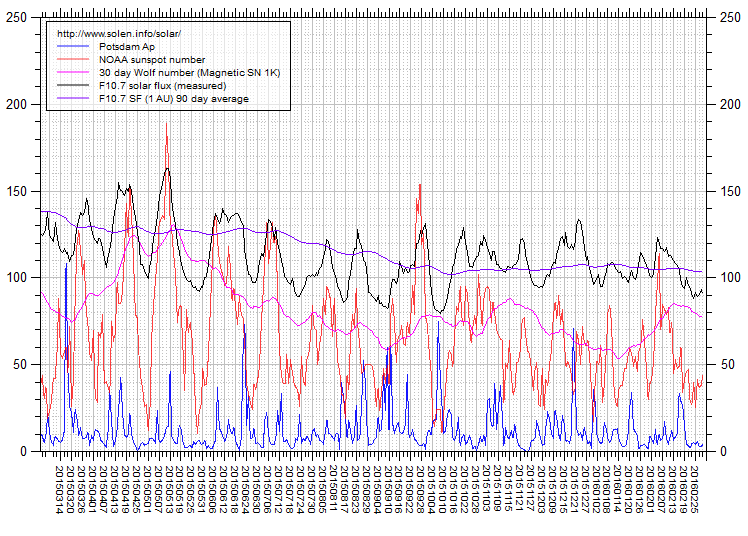 Solar flux at 20h UTC on 2.8 GHz was 94.9 (decreasing 5.6 over the last solar rotation). 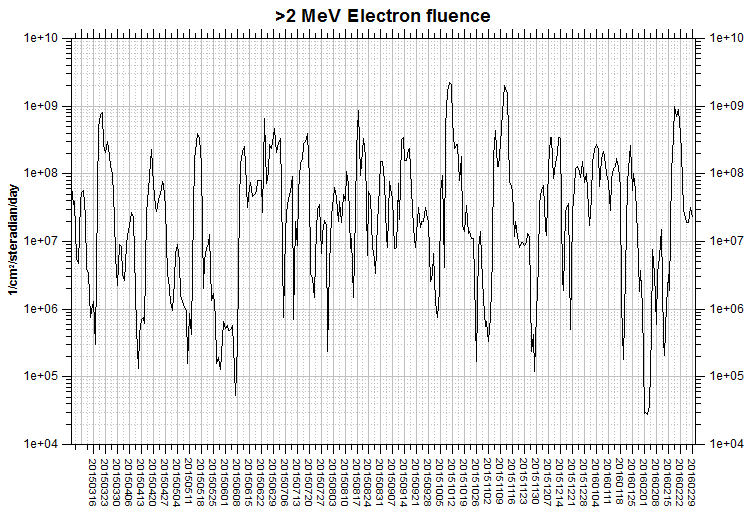 The 90 day 10.7 flux at 1 AU was 105.2. 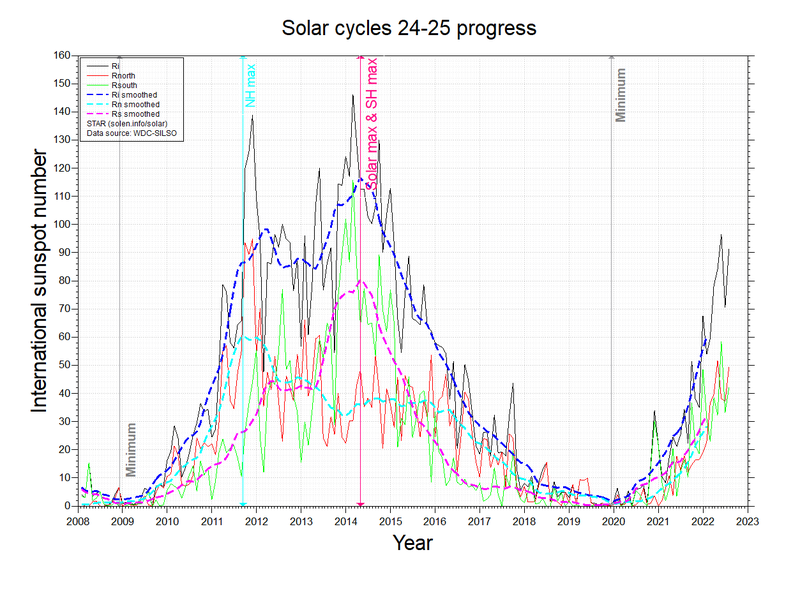 The Potsdam WDC planetary A index was 26 (STAR Ap - based on the mean of three hour interval ap indices: 25.9). 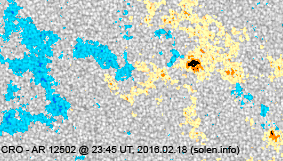 Three hour interval K indices: 45443443 (planetary), 35453343 (Boulder). 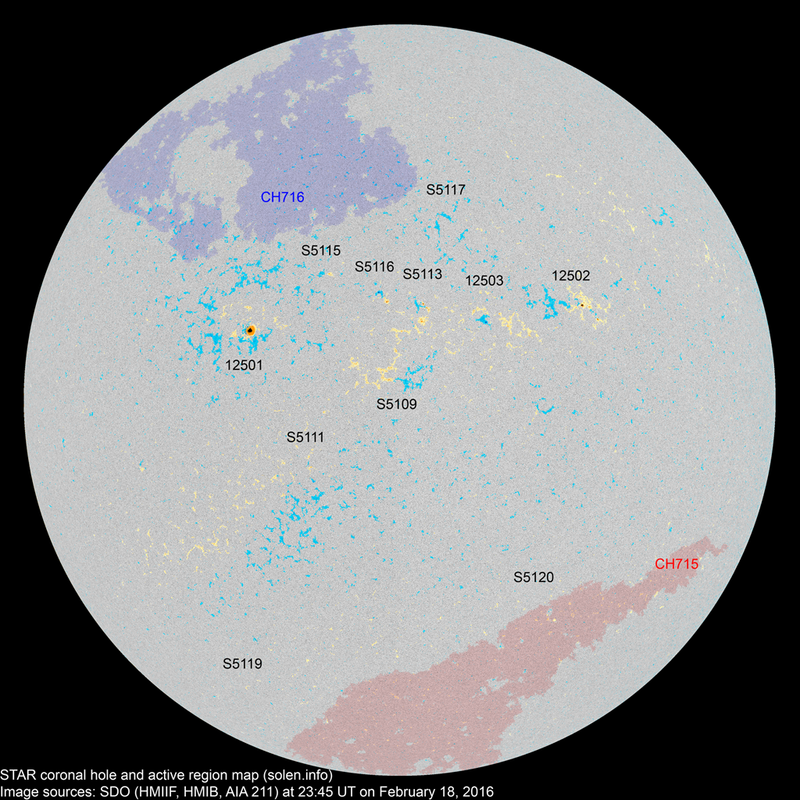 At the time of counting spots (see image time), spots were observed in 11 active regions using 2K resolution (SN: 168) and 9 active regions using 1K resolution (SN: 110) SDO images on the visible solar disk. Region 12501 [N04E24] was quiet and stable. Region 12502 [N08W29] decayed slowly and quietly. Region 12503 [N05W13] decayed slowly and quietly. S5109 [S03E03] was quiet and stable. S5111 [S19E15] reemerged with tiny spots. S5113 [N07W03] developed slowly and quietly. New region S5115 [N12E11] emerged with a tiny spot. New region S5116 [N09E03] emerged with a few spots. 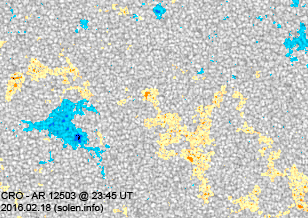 New region S5117 [N32W08] was observed with tiny spots. 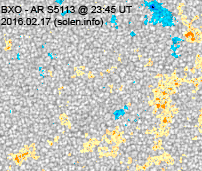 New region S5118 [S55E45] emerged with a tiny spot at a high latitude. 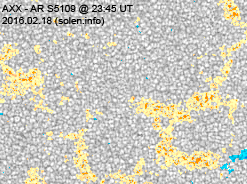 New region S5119 [S41W31] was observed with a tiny spot. 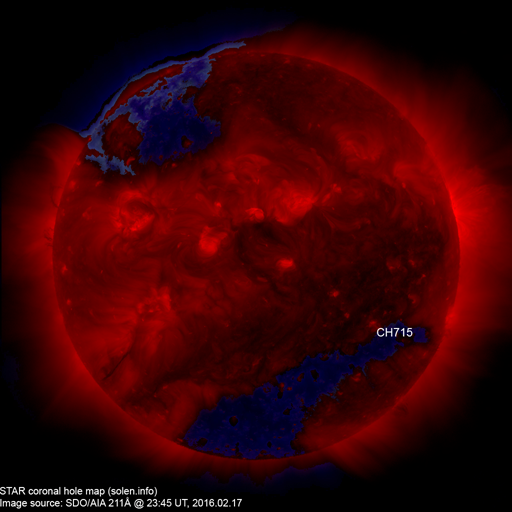 February 16-18: No obviously Earth directed CMEs were observed in available LASCO imagery. 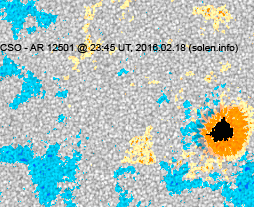 An extension (CH715) of the southern polar coronal hole rotated across the central meridian on February 13-14. The southern parts of a large, recurrent northern hemisphere coronal hole (CH716) could rotate into an Earth facing position on February 20-22. 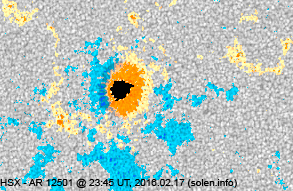 CH716 was too far to the north to cause a disturbance during the previous rotation. 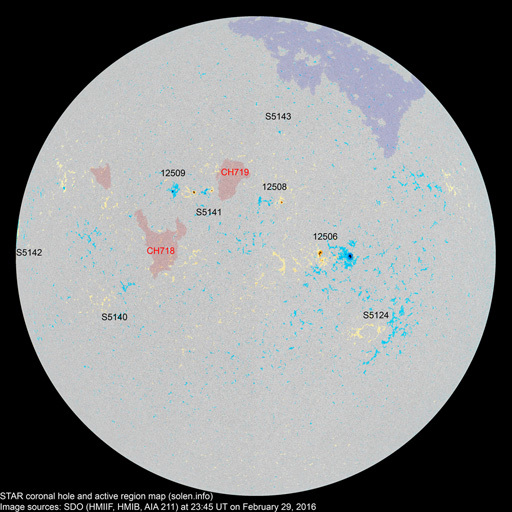 The geomagnetic field is expected to be quiet to active on February 19 due to effects from CH715, quiet to unsettled on February 20 and quiet on February 21-22.